Easy to use, made to last, and designed for safety. 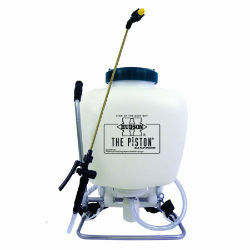 This sprayer has a translucent 4 gallon poly tank so it is easy see the liquid level. It is equipped with Viton® Seals, an external piston style pump, and a 20” brass wand with an adjustable poly cone pattern nozzle. Also includes bonus plastic flat fan nozzle, a locking shut-off valve with in-line filter, and a 47” industrial spray hose. The sprayer has a tubular steel pump handle. 1 year manufacturer warranty.